On October 15, the Supreme Court granted certiorari in response to six petitions requesting review of EPA’s authority to regulate greenhouse gases. This post will address some basic questions to clarify the scope of the question accepted for review and the implications and potential outcomes of the Supreme Court’s decision to grant cert. Which greenhouse gas regulations are at issue? The Supreme Court declined to review EPA’s endangerment finding or its regulation of greenhouse gas emissions from motor vehicles. Instead, it chose to review the prevention of significant deterioration (PSD) program–a preconstruction review and permitting program under the Clean Air Act (the CAA) that applies to new “major” stationary sources of “any air pollutant.”1 PSD permits subject sources to both site specific and technology-based requirements. EPA has long interpreted the PSD provision to require permitting for “major” sources of any pollutant regulated under the CAA. As a result, when EPA promulgated regulations for greenhouse gas emissions from automobiles in 2010, EPA determined that PSD permitting requirements were automatically triggered. PSD permitting for greenhouse gases, however, posed logistical problems. The CAA defines sources as “major” for PSD purposes if they emit 100 tons per year of a given pollutant (or 250 tons for certain types of sources). Because greenhouse gasses are emitted in such large quantities, these limits would result in PSD regulation of a million or more stationary sources not usually subject to permitting, such as hospitals, schools and apartment buildings. To avoid such “absurd results,” the EPA developed the “tailoring rule,” which essentially adjusts the thresholds to practicable levels, with the plan of incorporating more emitters over time. 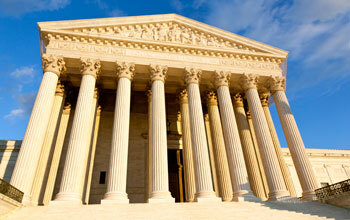 What aspect of the PSD permitting regulations is the Court reviewing? The Supreme Court has limited its review to: “Whether EPA permissibly determined that its regulation of greenhouse gas emissions from new motor vehicles triggered permitting requirements under the Clean Air Act for stationary sources that emit greenhouse gases.” In other words, the Court will review EPA’s interpretation that PSD permitting is automatically required once a pollutant is regulated under any section of the CAA. What questions has the Supreme Court declined to review and what are the implications? While the grant of certiorari casts uncertainty on the future of PSD permitting, many have pointed to the important implications of the Supreme Court’s refusal to review other questions presented in the petitions for certiorari. The Court declined to review EPA’s 2009 endangerment finding or its underlying science. The Court also declined to question EPA’s vehicle emissions standards. This narrow grant therefore may be read to implicitly uphold EPA’s non-PSD greenhouse gas rules and affirm EPA’s authority to address climate change through regulating greenhouse gas emissions under the CAA. What is the legal framework for determining whether EPA’s interpretation of the PSD provision is permissible? Addressing whether EPA’s determination was “permissible” alludes to the fact that EPA has a considerable level of discretion in statutory interpretation. The D.C. Circuit found that EPA’s current interpretation is based on the plain meaning of the statute. In order to find that EPA’s interpretation is impermissible, the Court would have to first find that the plain meaning is inconsistent with Congressional intent or that the provision is not as clear as the D.C. Circuit believed. This probably will require petitioners to convince the court either (1) that the D.C. Circuit got the plain meaning wrong; (2) that the provision should not be given its plain meaning because it would lead to absurd results; or (3) that the statute is not clear on its face and that EPA’s interpretation is not reasonable. Petitioners assert two lines of arguments as to why EPA’s interpretation is impermissible. First, they assert that Congress established PSD permitting for the purposes of ensuring attainment of National Ambient Air Quality Standards (NAAQS) and preventing reduction of air quality in given geographic areas. Thus, PSD provisions should be interpreted to subject only major sources of NAAQS pollutants to PSD permitting. Since there are no NAAQS for greenhouse gases, PSD permitting requirements do not apply. Second, petitioners maintain that EPA is not permitted to adopt an interpretation that yields “absurd” results (and requires contradicting other statutory provisions to overcome the absurd results) where such results could be avoided through an alternative interpretation. Judge Kavanaugh supported this argument in his dissent from the D.C. Circuit’s denial of the petition for rehearing en banc. What are the alternative interpretations of the PSD provision and how would they affect implementation of PSD permitting? While all of the petitioners agree that EPA’s interpretation is impermissible, they disagree about how the statute should be interpreted. Electric utilities, led by the Utility Air Regulatory Group (UARG), take a hardline view that PSD permitting only applies to NAAQS pollutants and should not regulate greenhouse gas emissions at all. This argument primarily hinges on interpreting “any air pollutant” in the PSD section to refer only to those pollutants regulated under NAAQS. If the Court were to adopt this interpretation, there would be no regulation of greenhouse gases in the PSD program under any circumstances until and unless EPA issued NAAQS for them (an action that would face its own major difficulties). On the other hand, the American Chemistry Council (ACC) focuses more narrowly on the triggering of PSD permitting. Instead of focusing on what is encompassed in the term “any air pollutant,” ACC bases its argument on what constitutes a “major” source for PSD purposes. PSD permitting is required for all “major” facilities “constructed in any area to which this part applies.”2 ACC maintains that the part of the CAA which is being referred to is Part C, which covers NAAQS pollutants. Thus, a facility can only be considered “major” for PSD purposes based on its emissions of NAAQs pollutants. However, they concede that once a plant is subject to PSD permitting for any NAAQS pollutant, it must adopt best available control technology (BACT) for all pollutants subject to regulation under the Act, not just NAAQS pollutants.3 This is an important distinction because most large emitters of greenhouse gases are also “major” facilities for NAAQS pollutants. According to ACC, their interpretation would still result in greenhouse gas regulation of the vast majority of stationary sources that are covered under the tailoring rule. Is the Supreme Court’s review constrained to the question for which it grants certiorari? The Supreme Court is not bound by the scope of the question to which it grants review. While the Court has shown no inclination to address broader questions proposed by petitions, the latitude left to the Court in this respect does raise some concerns. For example, if the Court holds EPA’s interpretation is permissible, it might move on to address whether petitioners have standing to challenge the tailoring rule, which the D.C. Circuit declined to address because it found petitioners did not have standing as to that rule since it did not really harm them. Were the Court to determine that petitioners do have standing, this would open the door for challenges to the tailoring rule. However, as Michael Gerrard discussed in a previous post regarding American Electric Power v. Connecticut,4 the Court is sharply divided over standing. Finding standing as to the tailoring rule could have broader consequences for standing doctrine, and it does not appear that the Supreme Court wishes to open that particular can of worms in this case. How could the outcome of the Supreme Court’s review affect President Obama’s Climate Action Plan? As part of the Climate Action Plan, Present Obama directed EPA to develop greenhouse standards for new and existing power plants. Just last month, EPA issued proposed regulations for new power plants. While the pollution standards will likely be challenged on their own accord, it is important to emphasize that they are not part of the current issue being addressed by the Supreme Court. New and existing stationary source standards and permitting provisions are in sections 111(b) and (d) of the Clean Air Act and are separate from PSD permitting requirements. Consequently, these regulations do not appear to be directly affected by the Court’s narrow grant. Had the Court taken on some of the broader questions presented, such as the EPA’s endangerment finding, the future of the new and existing source standards would have been in question.